the framers of the Constitution granted power to the president, they likewise imbued the legislative and judicial branches of government with the powers necessary to hold the executive in check. The Executive Branch, edited byJoel D. Aberbach and Mark A. Peterson, examines the delicate and shifting balance among the three branches of government, which is constantly renegotiated as political leaders contend with the public's paradoxical sentiments-yearning for strong executive leadership yet fearing too much executive power, and welcoming the benefits of public programs yet uneasy about, and indeed often distrusting, big government. 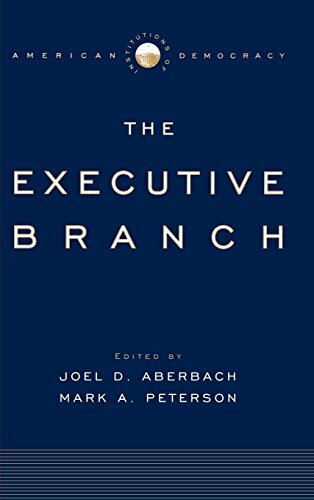 The Executive Branch, a collection of essays by some of the nation's leading political scientists and public policy scholars, examines the historical emergence and contemporary performance of the presidency and bureaucracy, as well as their respective relationships with the Congress, the courts, political parties, and American federalism. Presidential elections are defining moments for the nation's democracy-by linking citizens directly to their government, elections serve as a mechanism for exercising collective public choice. After the election, however, the work of government begins and involves elected and appointed political leaders at all levels of government, career civil servants, government contractors, interest organizations, the media, and engaged citizens. The essays in this volume delve deeply into the organizations and politics that make the executive branch such a complex and fascinating part of American government. The volume provides an assessment from the past to the present of the role and development of the presidency and executive branch agencies, including analysis of the favorable and problematic strategies, and personal attributes, that presidents have brought to the challenge of leadership. It examines the presidency and the executive agencies both separately and together as they influence-or are influenced by-other major institutions of American government and politics, with close attention to how they relate to civic participation and democracy.